We will sew your digitally printed banner with any sewing style we offer. We request they are received cut, trimmed and ready to sew. Up to 499 sq. 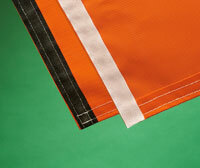 ft.
Quick Stitch Banners offers a wide range of sewing styles to fit you and your customers’ needs and specifications. All banners are sewn with white polymatic thread on our double lock stitch industrial sewing machines, which gives you durability and a professional appearance to your finished banner. Let our experienced staff know what product, color, finished size, quantity and direction; horizontal or vertical, you would need. All banners will be finished with #2 brass grommets. Nickel grommets are provided upon request. Most banners will ship out the same day the order is received. Black thread may be used, if requested, with a $10.00 color change fee. 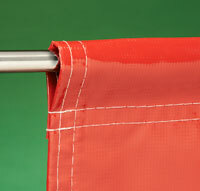 Allow 1 ¼ hem to all sides. 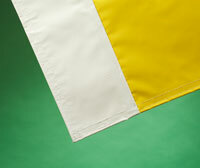 With web: 1” flat polywoven material which will give your banner added strength and durability. 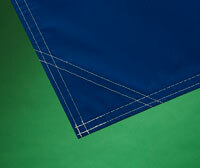 Webbing sewn throughout banner and extended out of the corners for hanging or tying. 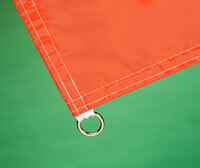 1” welded ring attaches to the corners of the banner with white webbing. Please specify the outside diameter of the pole. 1 ½” of extra material per pocket. 3” of extra material per pocket. 4’ of extra material per pocket. 4 ¾” of extra material per pocket. 5 ½” of extra material per pocket. 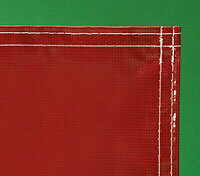 6 ½’ of extra material per pocket. Pockets can be added to any or all sides, per specifications. 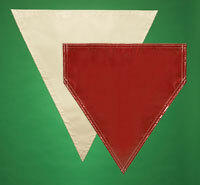 Gussets are reinforced triangles of banner material which are sewn into the back of each corner for added strength and durability. Panels are sewn together first then the perimeter is sewn. We will make every effort to match each panel’s graphics. Please call our staff for special instructions before printing. We will explain our sewing specifications. Can be sewn with or without pole pockets. #2 Brass or Nickel. 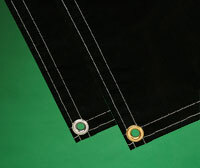 All Banners are produced with Brass grommets; Nickel upon request with standard grommet spacing. 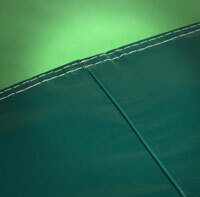 Let us know if you need special grommet placement. 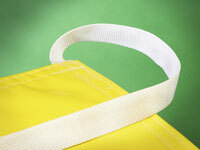 Hook or loop Velcro in black or white can be sewn onto the front or back side of the banner. Please specify. Any color combo. Please provide dimension of each color and sewing style. Raw edges not sewn. Please specify exact size needed.